CNG: Printed Auction CNG 75. COLOMBIA, Colonial. Felipe IV. King of Spain, 1621-1665. AV 2 Escudos (6.61 g). 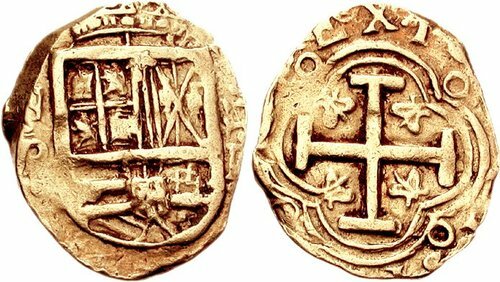 Bogota mint; R, assayer. Dated 1652 or 1654. Sale: CNG 75, Lot: 1237. Estimate $1000. Sold For $1075. This amount does not include the buyer’s fee. COLOMBIA, Colonial. Felipe IV. King of Spain, 1621-1665. AV 2 Escudos (6.61 g). Bogota mint; R, assayer. Dated 1652 or 1654. Crowned royal coat-of-arms; N/•/R to left of shield, II/•/R to right / Cross potent within quadrilobe with points ending in lis; annulets in spandrels, 16(52 or 54) in legend. Menzel Type SF-57; cf. ME 6689; KM 4.1. VF.